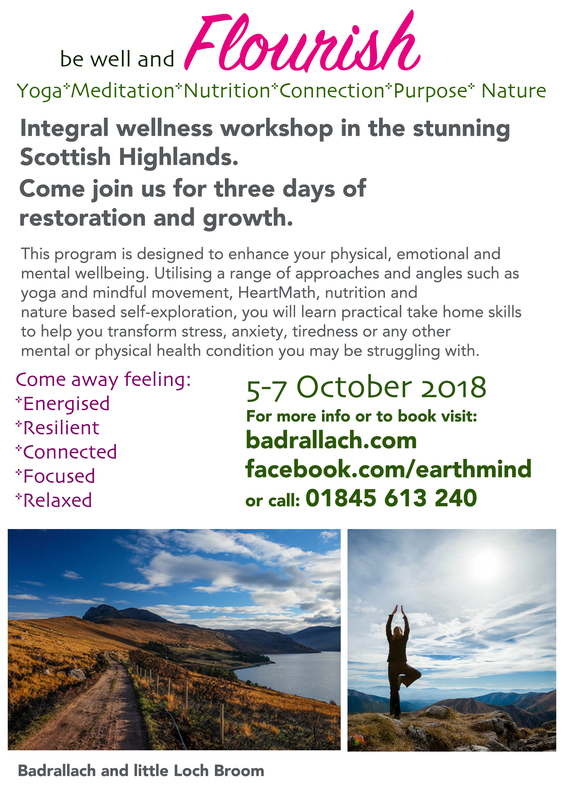 Integral wellness workshop in the stunning Scottish Highlands. Come join us for a weekend of restoration and growth! The weekend will offer you space and time to deeply connect with yourself, others and nature. You will have a chance to take a closer look at what may feel stuck, difficult or painful in your life and at what might be required to bring in a bit more flow and ease. 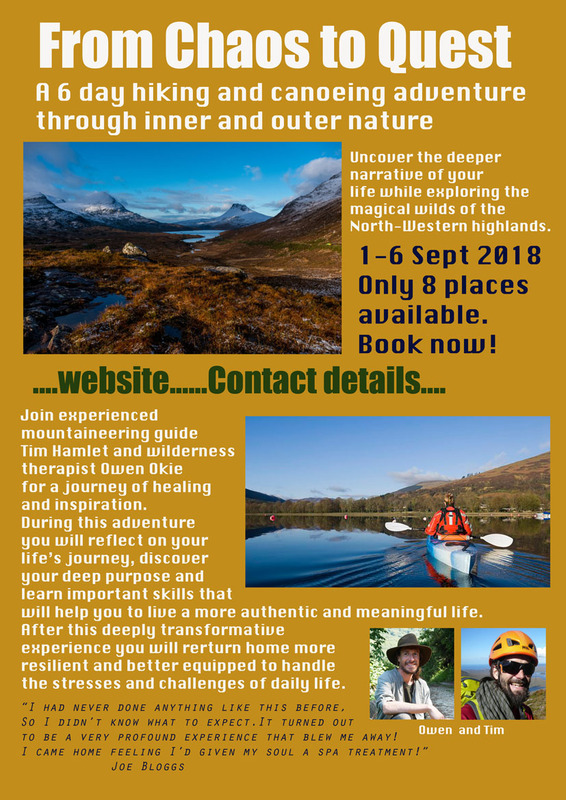 In this highly interactive and experiential workshop you will explore the different areas of your life and health to help you gain insight, groundedness and the confidence to make changes. The workshop will be facilitated by Owen Okie, medical herbalist, HeartMath provider and wilderness therapist and Bo Gort, counsellor and yoga/mindful movement instructor. It’s January. New Year’s Eve has come and gone. Old habits will shortly strong-arm your resolutions into submission and oblivion. Maybe a critical inner voice will guilt you into grudging obedience. Need some help? Come rest and do inner work with renowned herbalist and wilderness therapist, Owen Okie. 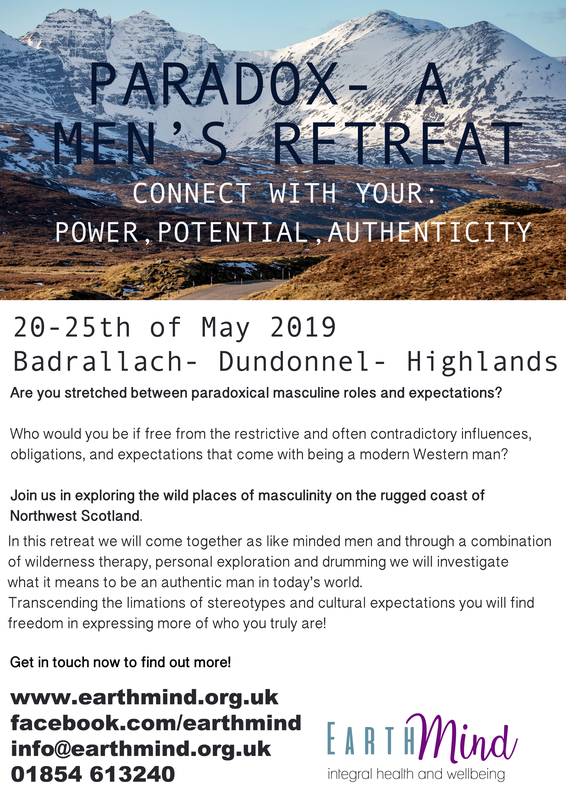 Renew yourself in the beautiful and remote Scottish Highlands. You choose what you want to work on, exploring nature, both inner and outer, of our winter landscape or within the shelter of our lovely, warm Bothy. Come to grips with parts of yourself that prevent growth and well-being. Make steps toward your highest potential through a variety of nature-based practices. Gaze into the flames of our warm woodstove and reflect. Venture out when you are ready, with new tools for transforming stress into resilience. Spots are filling up quickly! Email emf@earthmindfellowship.org to reserve your place. More information can be found at https://integralherbalism.wordpress.com/events/ . Where: We will be staying at Badrallach Campsite, Bothy and Cottage. There are three options for lodging; camping, bunkhouse accommodations in the bothy, or for a little extra in the cottage (subject to availability). When: You’ll arrive on the evening of January 4th and will settle in. Our Winter EarthMind Retreat will begin the next morning and will run till the morning of the 9th. How Much: In order to make our retreat accessible to all we offer a sliding scale from £200 to £400. This includes, lodging, meals, and activities. A work-stay may be available upon request. What are EarthMind Fellowship Seasonal Workshops? Skills for surviving and thriving in the wilderness and the world, inner and outer. We will be using a variety of approaches from Bill Plotkin, Wilderness Therapy, HeartMath, Buddhist Psychotherapy, and EarthMind’s own explorer’s kit. In our winter retreat, Deepest Darkness: exploring the North, we will be learning about and cultivating the Northern facet of your psyche through a variety of practices. Please see below for our new services which will be running from 3rd Feb at the Elgin Centre and 4th Feb at Lossiemouth. They are available on a Drop In basis and do not need to be pre booked. We also have a 4 week stress management course running for 4 weeks from 4th March which is pre bookable. All of our services are free and available to anyone affected by cancer in Moray. Please contact the centre if you require more details or information about the services and support we offer. Drop-in for stress-management, meditation guidance, and visualisation. As if there’s not enough going on in our day to day life, occasionally Life really “throws us into the deep end.” Learning new perspectives and techniques for dealing with stress makes all the difference between whether we “sink or swim.” When cancer comes into our life or the life of one we love we are thrown into a turbulent white-water stretch on the river of life and sometimes it’s all we can do to hold on…This is an opportunity to have some 1 to 1 support in alleviating your stress and distress and learning some new approaches to preventing stress. Come and learn some techniques for stopping your stress response, calming your nervous system, and turning emotional chaos into mental clarity. Whether you want to improve your self-care, learn to make less emotional decisions, decrease the aggravation of navigating the health care system, reduce the impact of stress on your body and immune system, or learn to better support others you are welcome to drop by CLAN for a session. Available for 4 weeks from Wednesday 2nd March 2pm -4pm. **Please pre book. Transform Stress into Resilience – Stress-management and Meditation for people affected by cancer. Whether you “have” cancer or are supporting someone with cancer its impact upon your life is often dramatic. What can you do decrease the impact of stress in your life, to maintain and build your resilience and resources, and to best take care of yourselves and others? In this 4-week class we will look into gaining a better understanding of “stress.” What is it’s impact upon our physical, mental, and emotional health? What triggers stress? And what can you do to prevent and transform it? We will be using HeartMath, a scientifically validated set of tools and techniques for transforming stress into resilience, and learning and practicing meditation and mindfulness, as well as discussing other perspectives and approaches for working with detrimental emotional states and attitudes. Along the way we will share our personal experiences and journeys with and through cancer as you develop your personal mental, emotional and physical strength and resilience in the face of life’s challenges. In order to gain the greatest benefit attendees are expected to attend the majority of sessions, and to practice between sessions. by learning about Herbs, Nutrition and HeartMath! My colleague Susan and I will be running a Health and Wellness Retreat at Kalikalos a holistic holiday centre on Mt. Pelion in Greece. Many of us struggle to keep up in today’s high-paced life. If you are dealing with “stress” fatigue, anxiety, or specific health conditions, or if you are simply looking to improve your own and your family’s well-being and vitality, this retreat can help you regain your footing! Welcome to a rare opportunity to be rejuvenated in a beautiful holistic retreat centre. You’ll be able to explore the remote beaches and mountains of Greece while learning techniques for maintaining and enhancing health and wellness. You can learn to decrease and prevent stress and its impact on your health, relationships, work, and life. The skills you will learn will serve you, hopefully, for a lifetime. You will have over 20 hours of instruction and practice. Owen and Susan will impart knowledge, tools and techniques while blending HeartMath and meditation with nutrition, herbal medicine and natural supplements. It’s an integral approach to health — addressing the physical, emotional, mental and spiritual aspects of your life. The vast majority of chronic conditions and disease are impacted by stress, and so they are often improved via techniques taught in this workshop. Our aim is to bring various strands of knowledge together into a coherent and synergistic package so you are able to formulate a treatment plan based on your individual needs. We hope to empower you to take charge of your own and your family’s health and well-being. This is YOUR workshop, especially if you . . .
Sound like a lot to get out of one workshop? Well, this is really five workshops wrapped into one! The workshops are unified by a few underlying principles that form a paradigmatic understanding of the process of evolution and growth. Delusion, stagnancy, and obstruction form disease, but you can learn to tap into your own wisdom, power and creativity — to move toward a better way of living. During this 6-day workshop, we will be using Integral Theory as our overall map or framework. This will enable us to see new and higher perspectives, to spot our own weaknesses, and to coordinate the various approaches taught in the workshop to create your own personal solutions. Herbal Medicine is the oldest system of medicine in the world, and remains in use by 80% of the global population. Learn the art and science of using plant medicines by awakening the senses: tasting, looking and listening to the plants. The information taught is based on ancient and modern texts. You’ll be able to discover your individual mind-body type — essential for true holistic healing — and tailor your remedies to your needs. HeartMath improves problem-solving skills, creativity, emotional intelligence, interpersonal skills, and physical and mental performance. It can be used at any time and in any place. It contains a set of tools and techniques for the transformation of stress into resilience. Resilient individuals know how to reduce the stressful effects of overload, time demands and emotional resistance more effectively. HeartMath teaches us how to maintain our flexibility and balance even while stressful circumstances occur. Creative Evolution was developed by Susan in order to educate through the power of creativity and play. In so doing, we re-establish how to reconnect with our innate aliveness and to feel whole, healthy and happy. Creative Evolution focuses on ways to identify our blind spots and engenders compassion for ourselves and other’s perspectives. Through a series of interactive exercises, we will access the creative spirit that allows our authentic selves to shine with grace, purpose, passion and meaning. 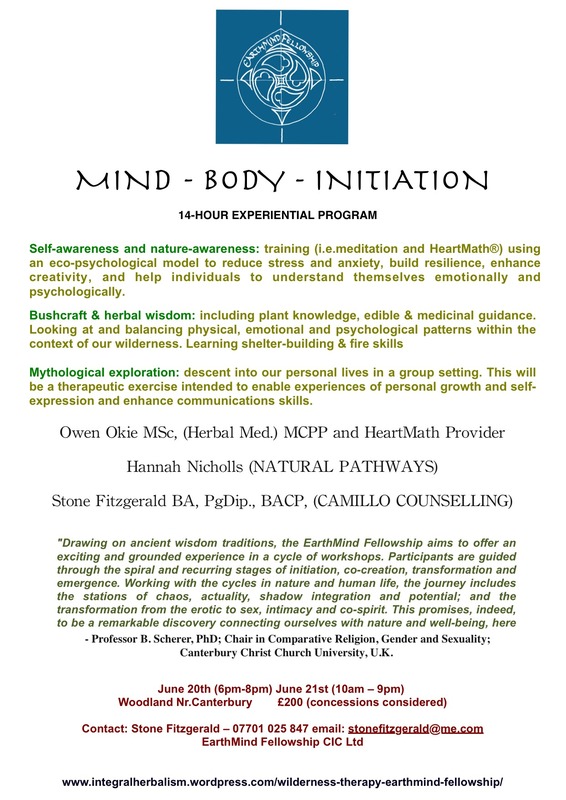 The goal of EarthMind Fellowship is to bring therapy and personal development into Nature. Developed by Owen and co-founder Stone Fitzgerald, EarthMind supports individuals in the exploration of nature, both inner and outer, for personal healing, self-awareness, and growth — thereby strengthening our connection to self and the world we live in. Kalikalos is nested upon the slopes of Mount Pelion. We shall walk into its mythic forests for a day of exploration in Nature. It’s cliché by now to say the world is interconnected and interdependent because we know this at various levels. However, we rarely live as if we know it. By learning to know and understand our inner drives; to witness, regulate and communicate our emotional weather; to change our no-longer adaptive habits; and to heal our old wounds, we grow into our own higher potentials. We also become more connected to nature and community — better able to gratefully gather in the gifts of the world and to more joyfully give our own. As our relation to ourselves improves, so does our relationship to others, our friends, family, colleagues, and the more-than-human community of the Earth, within which our life unfolds. The changes in you ripple outwards, affecting family, community and beyond, and supporting the process of growth and healing on an ever wider-scale. Creativity is a universal principle, evolution and growth, both on the large timescale of biological evolution, and the shorter time-scale of human development, are the process by which creativity is expressed. It is how the world, in all its ephemeral beauty and inexhaustible diversity, comes into being. This relentless drive to grow, to create, and to change can be blocked by habits, life circumstances, or internal resistance — resulting in a mental, emotional, and physical stagnancy which leads to the development of dis-ease. Two of the key factors involved in this process of growth versus stagnancy, health vs. ill-health, are Perception and Communication. By learning to perceive ourselves, our environment, and the other individuals in our lives more clearly we liberate ourselves from a great deal of stress and limitations. An essential step is becoming aware of and removing the distorting lenses of our old assumptions, emotions and our cultural and personal biases). We become grounded in our senses, in our body, in our sense-of-self, and present to our here and now. New pathways and new possibilities begin to unveil themselves before our eyes. Neuroscience speaks of the 3-brains, the reptilian, the mammalian, and the human brain which comprise your Central Nervous System as well as the Gut-brain and the Heart-brain. The extent to which communications within and between these various brains is coherent or incoherent largely determines your state of physical and mental well-being. Psychologically, it is the communications within and between the different aspects of your self-sense, or ego, which determines how well integrated you are and how well you function. For example, all of us have had the experience of internal conflict as exemplified by the idea of the little devil and the little angel perched upon our shoulders arguing. These various levels of communication move upwards and outwards into our community, the individuals and social systems we relate to, and in our exchanges and communications with our natural environment. Our health, our well-being, our flourishing and growth is intimately tied with these principles of perception and communications, creativity and evolution both within ourselves and with the world which surrounds us. Massages will also be available by appointment from Heather Ripley at Findhorn Bay Massage (http://findhornbaymassage.com). is a Medical Herbalist and Well-being Coach based in Leamington Spa, who specialises in mental illness, emotional imbalances and spiritual crisis. She is frequently found amongst the trees of Britain and beyond, basking in their wisdom and serenity. Owen Okie M.Sc. Herbal Medicine, MCPP. is a Herbalist, HeartMath Provider and Wilderness Therapist dwelling in Scotland. My goal is to support individuals with an integral framework which taps into the healing capacity of nature, both inner and outer, for healing, growth and transformation. 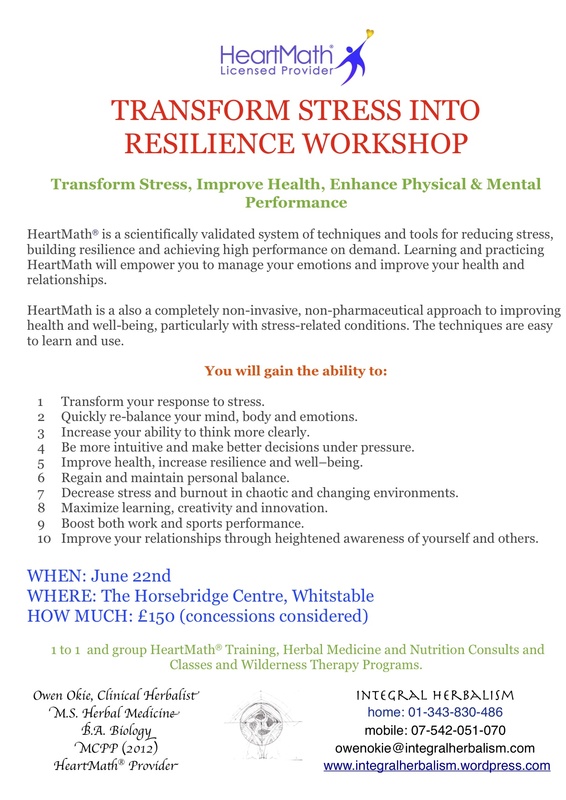 Transform Stress into Resilience Workshop.